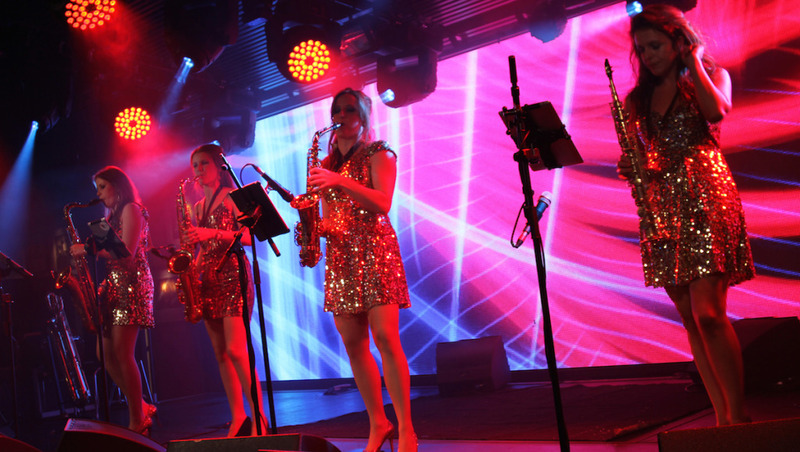 LLondon’s Female Saxophone Quartet perform an uptempo chill out pop set with backing tracks. Using IPads for a sleek modern look. A stylish act ideal to hire for drinks receptions, dinners or intertwined with DJ. A great alternative to Chill Out Ensembles and DJ acts. Trained at London’s leading music colleges, performing in gold sequin dresses . The pop set is a great way to liven up a party. For Christmas the girls will perform a mix of your favourite Christmas tunes – popular music of your choice. Individually the girls can be seen performing with some of the best orchestras in Europe, Big Bands, headlining on cruise ships around the world and performances with Hed Kandi. ”It was a great night and the girls were brilliant. Everyone had a really good time and we’ve had great comments. Please thank the girls on our behalf for a wonderful performance.” Launch Party, Lawyers Firm, Canary Wharf.